National Geographic photographer Pete McBride and writer Kevin Fedarko, veterans of dangerous journalism, hike the length of the Grand Canyon. Pushed to the edge of survival, they embark on the over-700-mile journey, letting the wilderness and their instinct be the guides. Immersed in unrelenting beauty, they find humility, reflective silence, and true partnership with each other and the canyon itself. Into the Canyon highlights the constant tension between developers out to monetize beauty, uranium ore miners polluting the waters, and Navajo and Havasupai defenders of the sacred ancestral land and water. During the 100th Anniversary of the Grand Canyon National Park, this powerful film asks what we want our National Parks to be and lets the canyon intimately share its grandeur, power, and indomitable spirit. Native Coloradan Pete McBride has spent two decades studying the world with a camera. 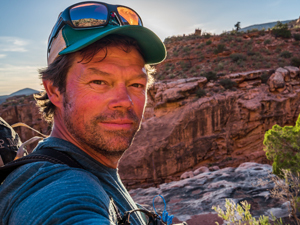 A self-taught photographer, filmmaker, writer, and public speaker, he has traveled on assignment to over 75 countries for the National Geographic Society, Smithsonian, Outside, Esquire, Microsoft, The Nature Conservancy, and many more. After a decade documenting remote expeditions from Everest to Antarctica, McBride decided to focus his cameras closer to home on a subject closer to his heart—his backyard river, the Colorado. Four years and 1500 river miles later, McBride produced a book, three award-winning short documentaries. and hosted a PBS TV program.